Yoder Smokers Community Forum • View topic - Hello to All! Hello meat smoking aficionados out there! Just taking a minute to say how much I look forward to this forum for ideas and answers, recipes too! I am a long time pellet grill/smoker owner........I have owned a Traeger for almost 12 years. But as it has aged, I new that eventually I would need to replace it. My son's boss is on a competition bbq team in Tulsa, and I was able to attend one of their completions a couple summers ago. It was there that I was introduced to the Yoder line of smokers and pellet grills, and it was then, too, that I told myself, (and my wife) that if I ever was going to replace the old smoker, it would be with one of these units! Well......as retirement looms........my lovely wife and I were discussing just this topic, and after some back and forth............she said.........go ahead and get it.......HAPPY RETIREMENT!! Woo WOO!!! 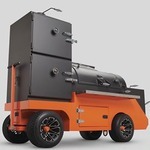 We picked up a YS640 from a dealer in Leroy IL, and it has been fun getting to know this smoker the past few weeks. This thing is a BEAST! I thought my older Traeger was heavy, but the Yoder model makes the old smoker seem like a toy! I also love the fact that there are two levels to cook on, and so far I love the shelves on the outside too! So, again, Hello to all out there............I hope this is the beginning of a delicious smoking relationship! !